Much of our organization's mission focuses on empowering children to build relationships. We see this "friendship-making" as varied and multidimensional. Some of our events cross racial, economic, cultural, or neighborhood divides. Since we were given the gift of working with Allie Holliday who is professionally trained as a rehabilitation therapist for stroke survivors, we also have a strong constellation of events that help our children build relationships across generations. Lynn Raines, co-founder of TOAM, initially made contact with St. John's on the Lake for our first ever TOAM event because she was aware of the great reputation of the facility. After our very positive Trick or Treat event in 2014, we sought to deepen our connection to St. John's. We started with an idea and then Allie and Angie, from St. John's, just ran with it. Now, we have two separate playgroups that meet monthly, three sessions a year. Some of our TOAM families have attended since they started in October, 2015 and many new families have joined us- which is so exciting. When it comes to raising children to thrive in our modern world, an important component of that is learning to get along with diverse groups of people including people they might not get to see at the playground or on the street every day. 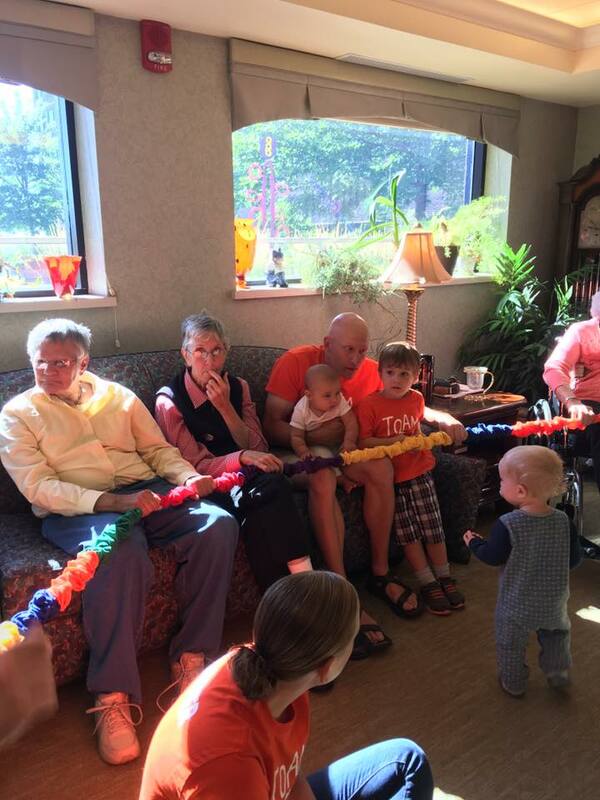 In the playgroups at St. John's, our children are getting to know men and women who were born sometimes 90 years before they were! Sharing stories, smiles, and fun helps both groups appreciate the light in each other. It is hard to overstate what Allie's inter-generational events have meant to some of our TOAM families. Families who have brought their children into hospitals find their children more at ease and aware of their innate power to lighten the mood. A TOAM family spent part of their summer vacation in a retirement complex in Texas and their son went into "TOAM-mode" and chatted up everyone he saw in the hallways. Our children are still young but it is our greatest hope that we will see their inter-generational experiences shine through their actions when they are older. One of our original TOAM kids insists on calling St. John's "the place that TOAM was born." And in many ways, that makes a lot of sense. We treasure our relationship with St. John's and we are so very grateful to Allie who has made our inter-generational missions so special.